Quick description: Four fifteen-minute segments, alternating between the treadmill and floor exercises. What it was like: Going in, I probably knew the least about Shred415, but I LOVED this workout. After checking in, the girls at the front desk introduced me to the instructor, Trish, who walked me through the format of the class. Like the name of the studio implies, the class consists of four fifteen-minute segments, either running on the treadmill or doing weight and body exercises on the benches on the floor. Trish suggested that first-timers start out with the treadmill, which I really liked—I think it’s a bit easier to end the hour with weights instead than sprints! When you first get going on the treadmill, you choose your “base pace” for the class (this could be running or walking, depending on what you feel comfortable with), keeping in mind that you’ll be adding more incline or speed from there. Shred415 was my first time running on Woodway treadmills, which are awesome. Woodway treadmills are supposed to be super smooth and lower impact, and I could definitely tell the difference. Fifteen minutes may sound like a long time to run on the treadmill if you aren’t typically a runner, but the time flew by, and you got just the right amount of walk breaks. Plus, like I mentioned, the running portion of the class is what you make it—people were running at all different paces and inclines. After each treadmill segment, we swapped places with the people on the floor and spent fifteen minutes doing a mix of different bodyweight exercises. Sometimes I feel like weight classes move too quickly or you skip over certain muscle groups, but this felt like an incredible full body workout. The ab portion at the end was KILLER. We finished up with some stretching and then everyone went on with their Friday nights! Overall impression: Especially since Shred415 is available through ClassPass, I’m pretty excited to add the workout into my routine. The amazing playlist during the class put me in a fabulous mood, and it was a great way to kick off the weekend. The overall vibe of the studio and staff was super friendly but just competitive enough to make me want to work hard. Something to note for moms, too—most of the Shred415 locations in Chicago offer childcare! What it was like: Signing up for your first Orangetheory class is a bit more involved, but it’s really not that hard once you figure it out. My fabulous friend Lauren (hi, Lauren!) agreed to join me to a 6:45 pm class on Monday, and we signed up for the workout at the Lincoln Park studio using this link. They’ll have you come in about 30 minutes before your first, just so they can show you around the studio, ask you a few questions about your personal fitness history and goals, and introduce you to the instructor. 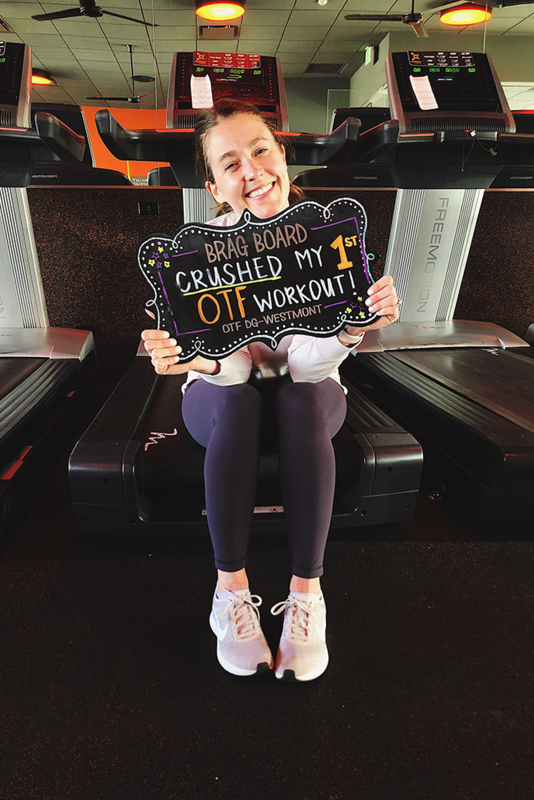 They also give you a heart rate monitor to wear during the class, which is one of the main things that sets Orangetheory apart from other HIIT workouts—your goal is to spend at least 12 minutes in the “orange zone” (84-91% of your max heart rate) to optimize the amount of calories you burn post-workout, even while sitting at your desk the next day. If you spend at least a minute in the orange zone or above, you’ll get a “splat point.” After your first class is over, you’ll meet with the instructor to go over your performance in the class, and they’ll tell you how you can sign up for more classes/packages if you are interested. Lauren and I started off on the rowing machines, which was hard. (So much respect for my brother, who was on the crew team in college). We rowed until we reached a specific distance, then hopped up and did a few exercises with a medicine ball before coming back to the rowing. Next, we moved to the floor, where another instructor showed us a series of about 8 exercises (involving hand weights and Bosu balls) to rotate through. I really liked that the classroom had video screens up on the wall with people demonstrating how to do the floor moves—you never forgot what you were supposed to be doing! Finally, we ended with sprints and incline on the treadmill, which is when I really started to get into some of those higher heart rate zones. Although, confession: I only got one Splat point during the whole class. ONE. I asked the instructor about it after class, and he said that since I run pretty often and have a low resting heart rate, it will be a bit harder for me to get into those higher zones. Apparently, once you sign up for a membership and get your own heart rate monitor, the Orangetheory team can design settings and goals specific to you (pretty cool!). OT was an amazing workout! I think I burned 560 calories in a 50-minute class which is pretty legit. I found myself getting super competitive (mainly with the badass girls who were always ahead of me!) and can see how you would be excited to get back to class to beat your previous score. My teacher, Nicole at Orangetheory Downers Grove, was super helpful and made me feel comfortable as I settled into the routine. She introduced me to the guy next to me and mentioned to him that it was my first class. You could tell that everyone there was a tried and true regular which I personally appreciate in a workout class. I like finding my people! My new friend gave me high fives throughout the entire class and made me feel like I wasn’t a newbie. I usually get super intimidated to try a new workout but this classroom setting felt very welcoming. The class consisted of all different body types, different skill sets and no one was watching your pace. I felt like I was in complete control of how hard I worked and everyone was cheering for you either way. The only downside I see with OT is that they don’t have childcare which is a real bummer considering Jack is home with me every day. Otherwise, amazing workout and my booty was sore for DAYS. Overall impression: I’m so happy that I finally got to try Orangetheory! Like Liz said, I can see why people get really into it. The heart rate monitor aspect is really interesting, too—it is a bit distracting to keep checking your stats throughout the workout, but talk about holding yourself accountable. After only getting ONE splat point (haha), I was extra motivated to go back and try to get a few more. Oh, and a bit of helpful insight from my friend Lauren: she is super fit and active, but mostly does yoga and pilates. She was nervous to try an intense cardio workout, but she said it was not as bad as she thought it would be—proof that the class is accessible even for non-runners. What it was like: If I’m being honest, Barry’s always terrified me a bit. It just seemed like one of those places where everyone would be very fancy and insanely fit. I’m happy to report, however, that all the people I’ve met at Barry’s have been extremely normal and nice, and the beautiful facilities are just one of the perks! Barry’s also uses Woodway treadmills (my favorite), and most everyone in my class chose to start out on the treadmill. One girl stayed on the floor the whole time, which is totally an option, too. I think out of all three classes, this treadmill portion may have been the hardest. We would start out at a jog, usually for a minute or so, and the move up to 60-90 seconds of running, followed by 30-60 seconds of sprints. Right when I thought I was going to have to slow down, we would be rewarded with one minute of walking at whatever pace you wanted. After every treadmill section, we would move to our assigned bench on the floor for leg and booty exercises (soooo many squats). Overall impression: Even if it was challenging, I thought Barry’s was so much fun! First of all, the playlist was too good—a mix all my pop and hip-hop favorites. Secondly, it was just one of those workouts that makes you feel like a celebrity. I even had a smoothie waiting for me when I was done! I can’t wait to try it again, even if it is just once a month to mix it up. I hope this is helpful for you guys! Have any of you tried Orangetheory, Shred415 or Barry’s? Do you have a favorite? Shred415 image courtesy of the Chicago Tribune. Love shred! I got into it with ClassPass too and is one of my favorites work outs ever. This is a great breakdown of each workout! I used to go to the Shred415 in LP and loved it! I definitely need to try OT and Barrys! I have taken OTF classes before and really enjoyed them. I have a family member instructs at an OTF and she said that even if you do it twice a week with some other kind of physical activity on a third day that you would see good results within 1.5 months. My only complaint with any of these types of studios is that they are really pricey. I wouldn’t be able to afford a gym membership and a membership to one of these studios. I like the gym because I have many options (pool, classes, machines, etc) and usually gyms do have childcare. I think the OTF in my city neighborhood is $200/month for unlimited and like $150/month of 8 sessions a month. I’m sure those other studios are just as pricey or more. Also the city OTF are *premier locations and are more pricey than the ones in the suburbs. Nice option to have though if you really want to change up your workout every once in a while. Love Barrys! I want to try OT sometime soon but Barrys in RN and LP are both awesome! I would also suggest torch classes at studio three. Erin is my personal fave for instructors but they’re all so good. You are just killing it lady! Such an inspiration!! I’ve wanted to try OrangeTheory. I just can’t find a place close by! Maybe next time I’m in Chicago! I tried Orangetheory just over a year ago and have not looked back. It is the first class I’ve ever been able to stick with for more than a few months and commit to 3+ times each week. I actually gave up my regular gym membership for the unlimited package. I was wasting money on a gym membership I was never using and reasoned that even though OTF is pricey, it’s worth it if I actually go! It is so fun to hear about all the different workout classes. No matter how much you read about them online, there’s nothing quite like hearing from someone who has experienced a class and can compare multiple options. Thanks for doing the leg work (literally) on this, Carolyn (and Liz)! Thanks so much for the feature and great shoutout today on your blog, Liz! We loved having you in class at Shred415 and can’t wait to see you again soon! You rocked it! 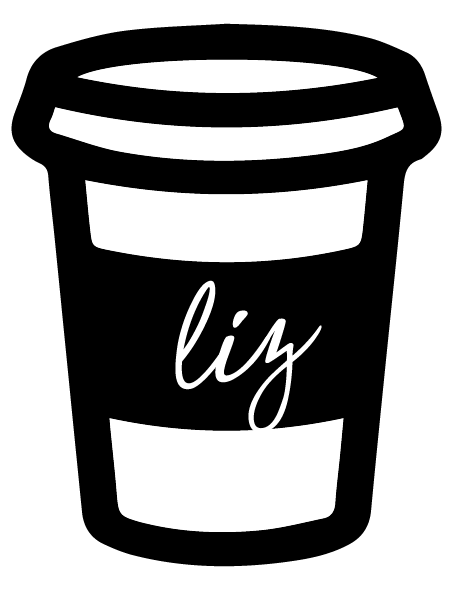 Thanks so much for the awesome feature and shoutout on our blog Liz! Carolyn crushed it in class at Shred415 and hope you can make it in soon! Let me know when you would like to come as your first class is free of charge 🙂 take care! Shred 415 is my JAM!!!! The recently expanded to Milwaukee and it’s the best!! I liked OT when I tried it , but feel like Shred is a better fit for me. I’ve been doing it for 4 months at least 4 times a week and I keep wondering when it’s going to get any easier. That’s when you know it’s an awesome workout!!! A Weight Training Video + New Workout Playlist!